For Activities where kilometres need to be tracked, billed and/or reimbursed, the following functionality is available. Do the kilometres need to be tracked OR billed? If being billed, how will the Client be paying for these kilometres? Does the Staff member facilitating the Activity need to be reimbursed for any private kilometres entered? What is the difference between Private and Company Kilometres? Private kilometres may be entered when Staff have used their own vehicle to assist or attend an Activity and require reimbursement. Company kilometres may be entered and tracked when a company owned vehicle has been used and may require invoicing to the Client. How does SupportAbility know what to charge for non-NDIS Private and/or Company Kilometres? 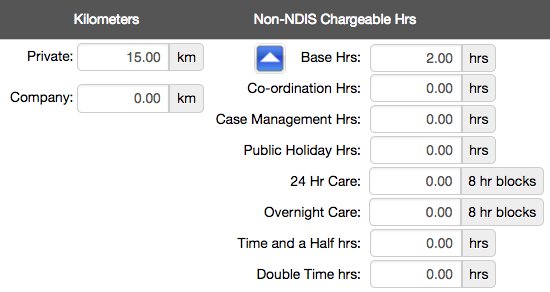 Any non-NDIS Private or Company Kilometres that require billing are calculated based on the rate specified in the corresponding Service's Rate Card. N.B. The current functionality available to manage Billable and/or non-NDIS funding is rather limited and does not suit many Providers needs. Please review the linked article for more information regarding the available options to manage this to determine if this will be sufficient for your organisation. Can Private and Company Kilometres be allocated to NDIS funding? Kilometres entered in the Private and/or Company kilometres section may be added to the NDIS Support Allocation quantity of the Transport NDIS Support item if required. How will kilometres be billed in group Activities ? How are Private kilometres reimbursed? N.B. This information will appear differently based on the export that your organisation is using. It is also important to note that Company Kilometres will only appear on the Summary and Detailed Time Sheets exports.